We can design and create any vision of the outdoors! Since 1984, Northern Scapes Inc. has grown into one of the largest full service landscape companies in the Southern Tier of New York. At Northern Scapes we know that the best design is one that incorporates the needs and ideas of our customers. We work with you to design a unique plan to your specifications. Let our team use the latest technology to design and plan your project. We are able to provide you with full color images of a completed project before the work begins. 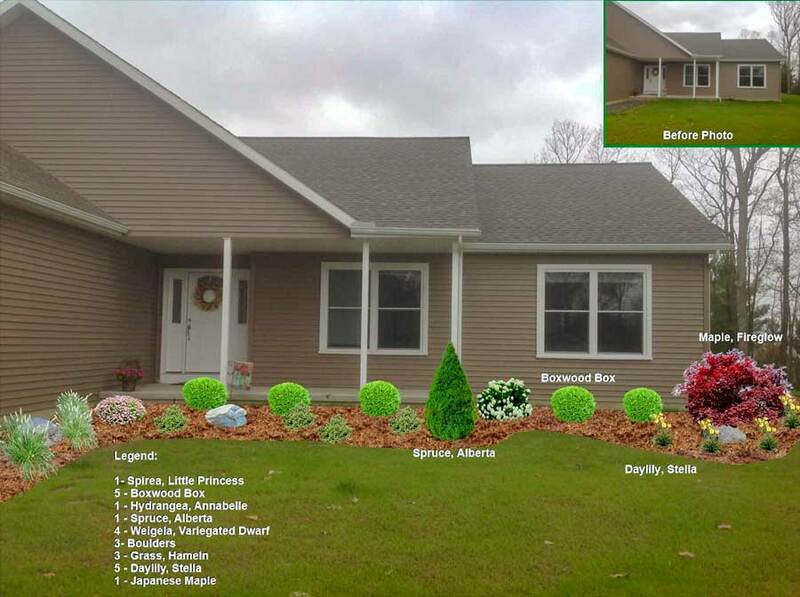 We can help you visualize what your property will look like. Landscape Software - With this software we take photos of your home and property. Next, we upload the photos into the program and clean up as much of the background as we can (ex: Plants that are going to be removed or replaced) before we begin the design. Then we will demonstrate what the landscape and/or hardscape design will look like. 3D Virtual Tour Software - In addition to the capabilities of the software above, we are able to create a virtual tour of your house and surrounding property with the 3D software. This powerful design technique allows you to see your design from multiple perspectives. 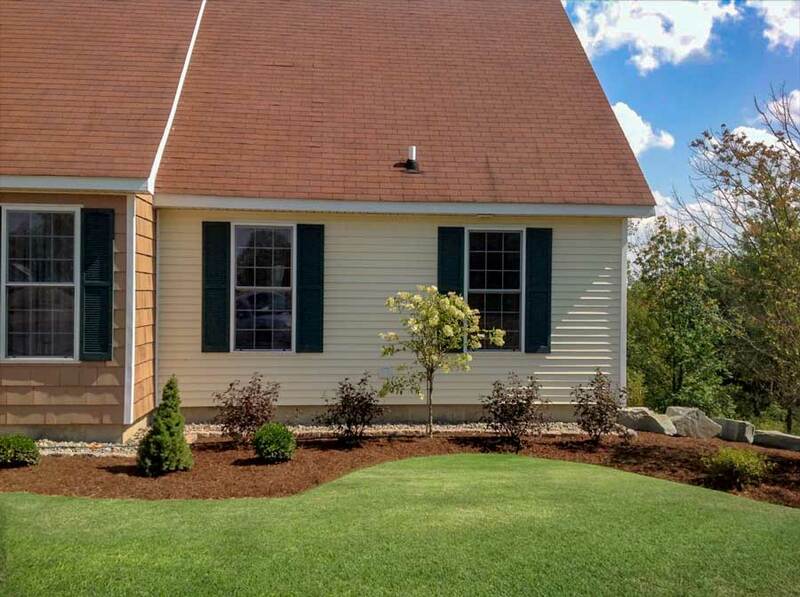 After the design has been completed, our experienced professionals will install your landscaping with the same attention to detail that our customers have come to expect from our company. Site preparation is the key to the longevity of any project. Our crews have the experience and equipment to properly prepare the site for the installation process. Once the grade is established and the drainage concerns are addressed, our professionals will install your project. 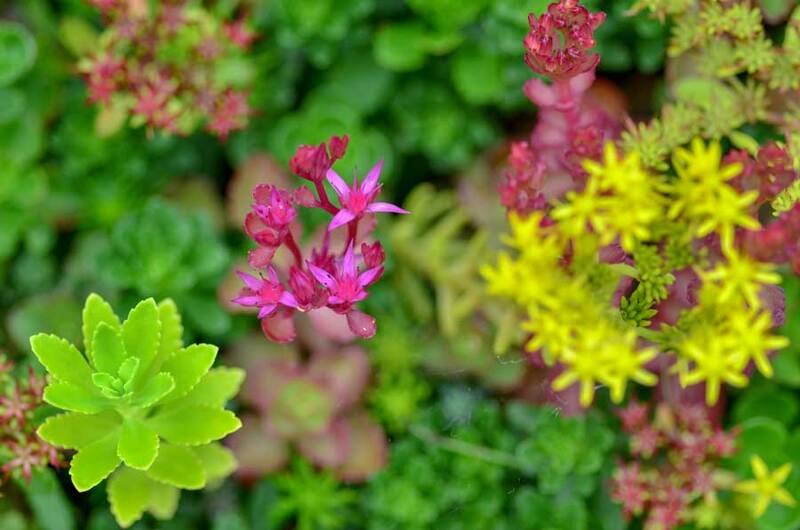 We have a one year guarantee on plant material and workmanship. For retaining walls and pavers we have a five year guarantee on our workmanship. Our company caters to all types of residential and commercial projects. No matter the project, you can expect exceptional quality, workmanship, and service! Is it time to freshen up your home, business or vacation property? We are proud to service Endicott, Endwell, Vestal, Johnson City, Binghamton, Ithaca, the Southern Tier of New York and surrounding areas. Our service area is 200 miles from Greater Binghamton. If you are around the Finger Lakes, Ithaca, Skaneateles, Auburn, on Cayuga or Seneca Lakes and are in need of someone to provide you a hardscape or landscape solution, contact us! We can help! We have free consults and estimates. However, if you would like a custom design from Northern Scapes there is a design charge. See the two options below. ***The design fee is due once it has been presented to you at our office. No design may leave the office without payment. If you decide to contract with Northern Scapes, the design fee is deducted from your contracted project cost. We installed pathway lights in the landscaping beds and a spot light for the tree. We also used Techo-Bloc Parisien pavers for the walkway. 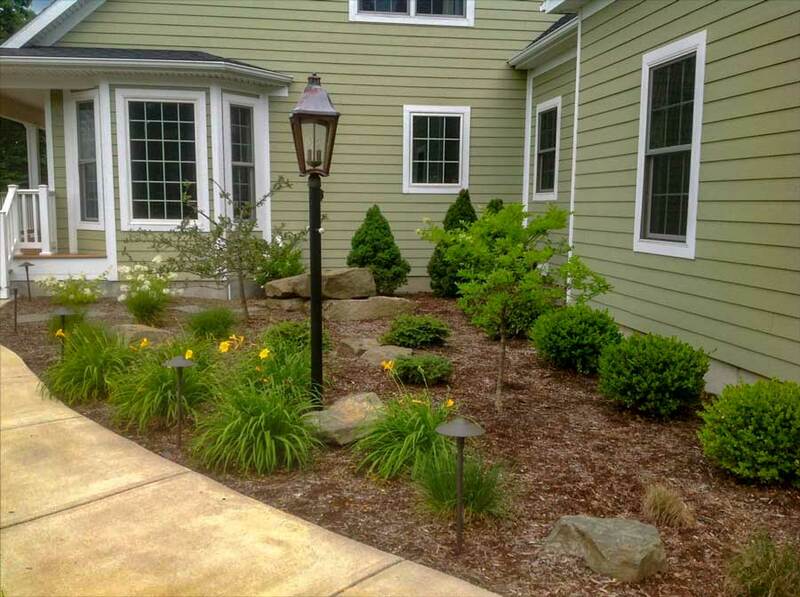 This landscape project was completed in Binghamton, NY. To address the drainage along the house, we installed #3 round river rock for the drip edge. 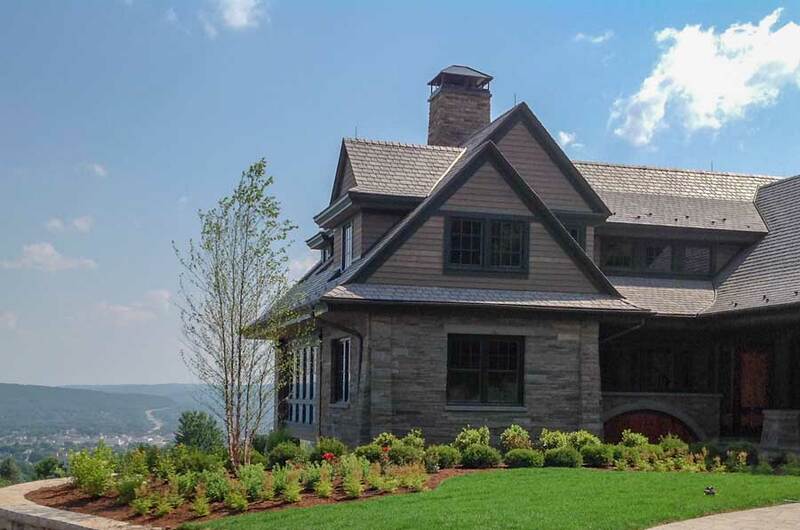 This landscape project was completed in Johnson City, NY. We like to use Kichler Lighting which is used for the pathway lights in this project. We also installed the boulders that complete this landscape design. 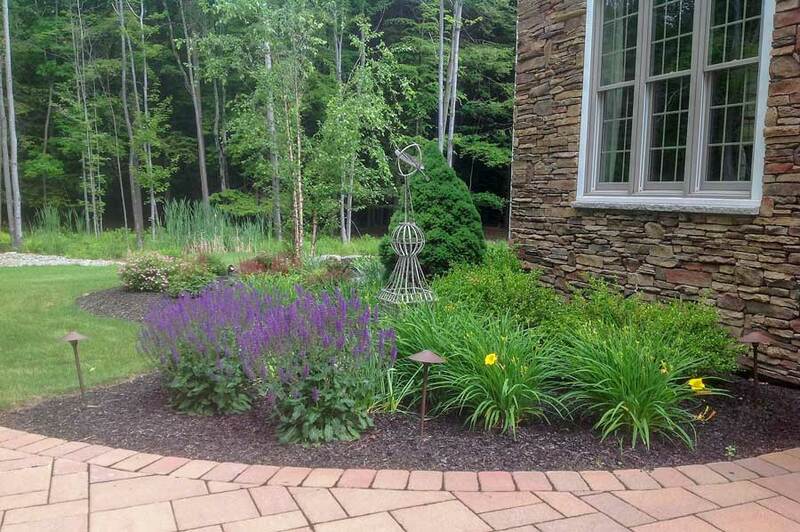 This landscape project was completed in Vestal, NY. This beautiful landscape bed has a BOULDER look! 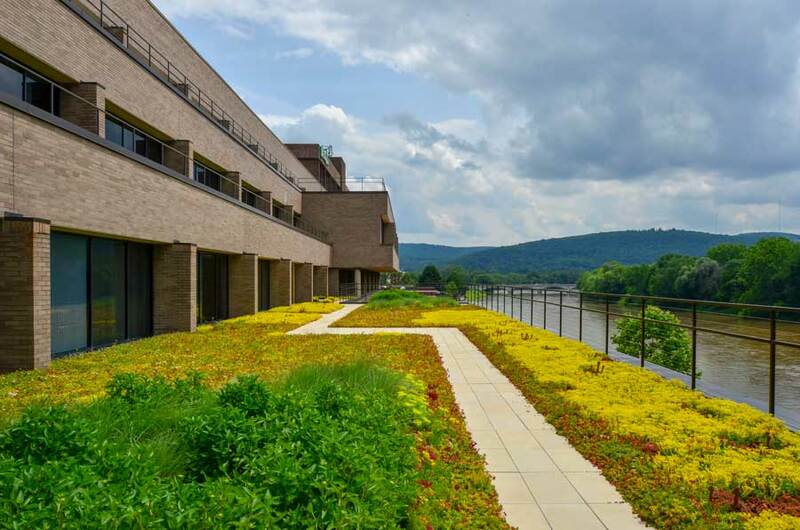 This landscape project was completed in Binghamton, NY. This landscape island has a Basalt Rock Column water feature that has lighting. This project also displays accent lighting from Kichler Lighting. River rock, boulders and red mulch complete the island. 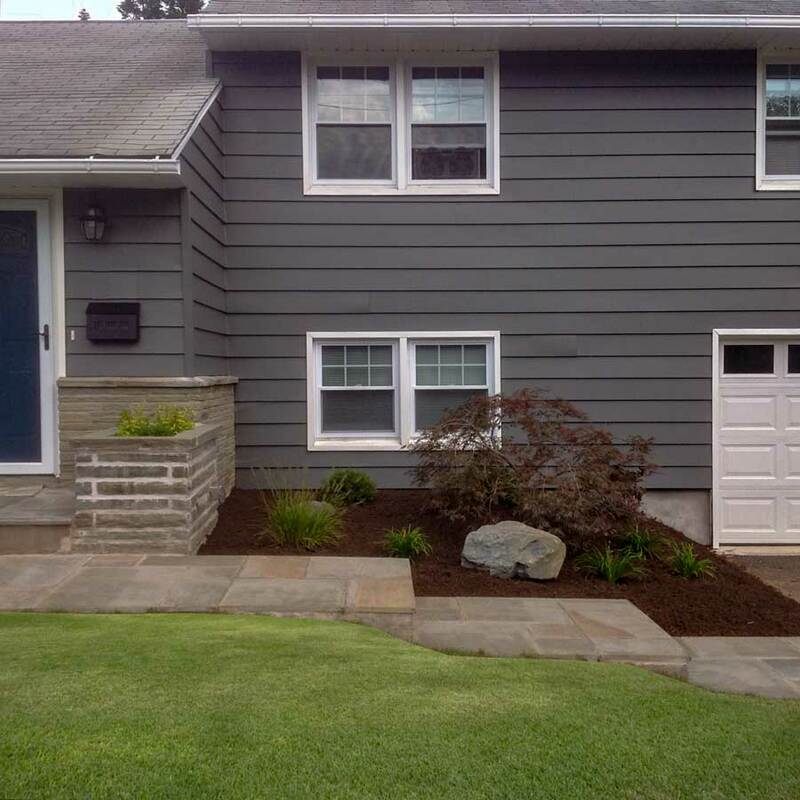 This landscape project was completed in Binghamton, NY. We installed a lush sod lawn next to the landscape bed. 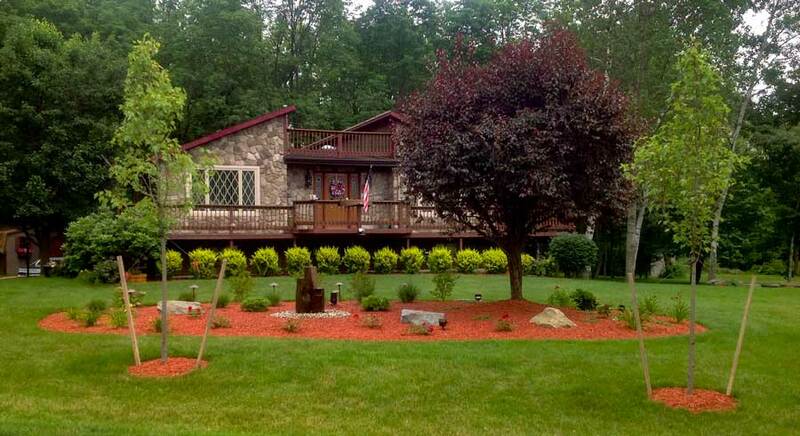 This landscape project was completed in Endwell, NY. It’s becoming more popular to see putting greens in landscape areas. 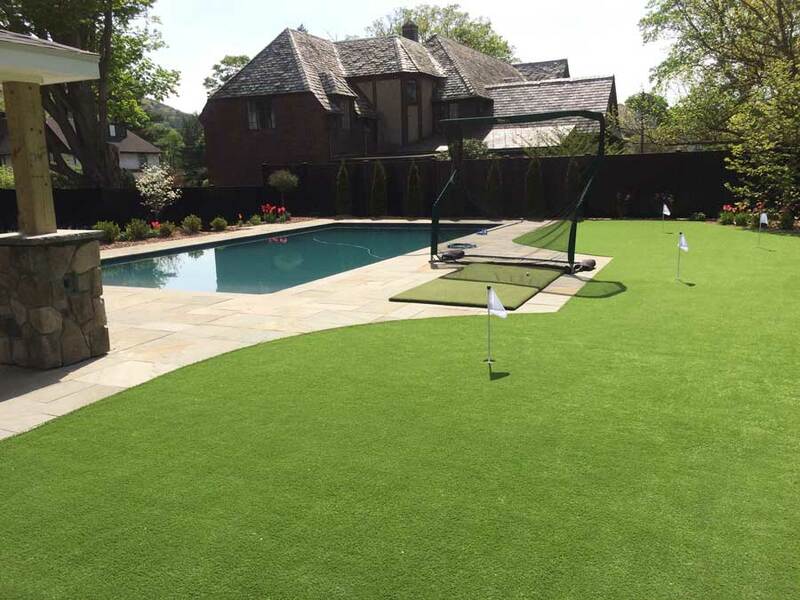 We installed this putting green in Binghamton, NY. We installed the landscaping and used cultured stone on the column. We were also responsible for installation of the fence. 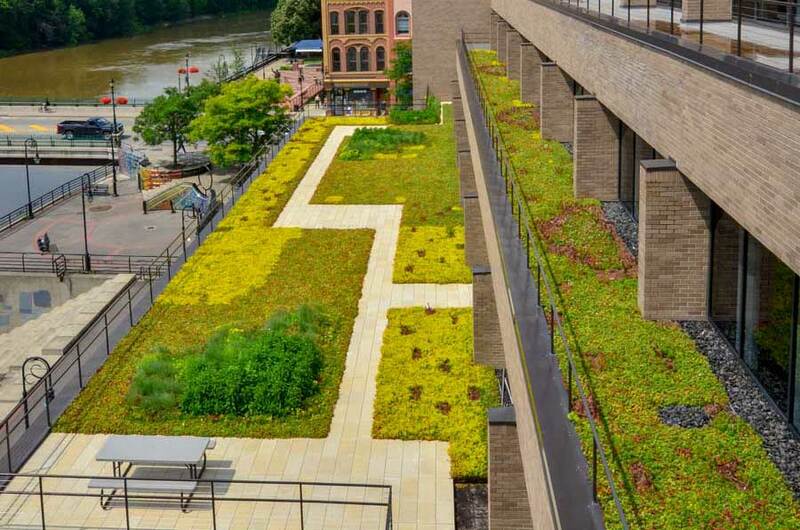 This is a green roof that we installed at 2 Court Street in Binghamton, NY. There are two levels and a walkway. The lower level is utilized by the tenants to enjoy. 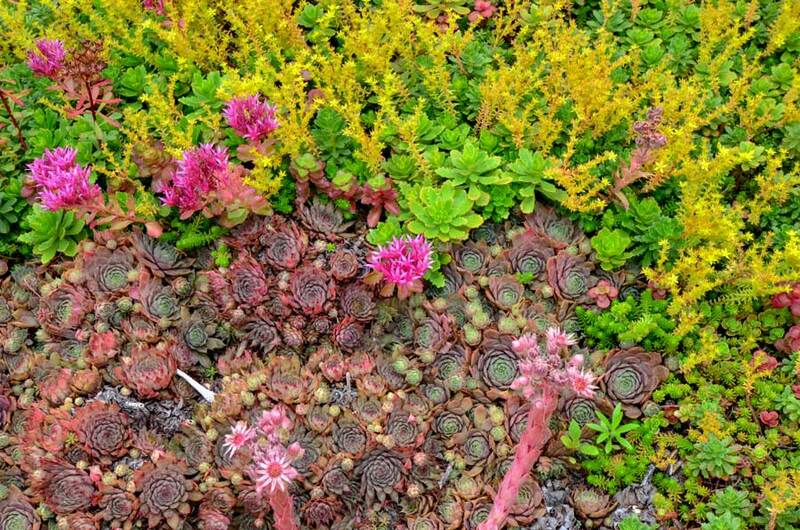 These gorgeous plants were used on the green roof at 2 Court Street in Binghamton, NY.